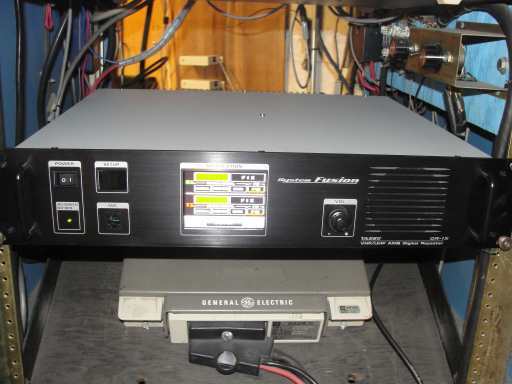 New System Fusion Repeater "On-Line"
(May 1, 2015) - - After over 30 years of faithful community service, on Thursday, April 23rd Stark Co ARES installed the new Yaesu System Fusion Digital Repeater replacing our old GE Master II repeater and the ACC RC-850 Controller. The new system is currently running at 20 watts output while we make running adjustments to various aspects of repeater operation. The few tests we have run so far would indicate excellent receiver performance with transmit range equal or better that the GE System. Please note that the new system runs full time PL. It will now be necessary for you to set your radio's transmit a PL Encode tone of 110.9 Hz. This should help with dependable operation during band openings and other interference. The system is housed is our existing cabinet. A picture of show below. One new aspect of this system that users will discover is that it has no hang time or reset courtesy tone. Another change is it has no voice, all ID functions will be made in CW only. This is a no Bells or Whistles unit. Also we regret that for now, we have suspended the replay of Amateur Radio Newsline. We are looking into ways to restore this feature in the future. The new system will be a big change from our GE unit, in that we now have a state of the art repeater. While the new unit supports the C4FM Digital Voice Technology, it has been set to operate traditional analog FM made. With the installation of this new technology the repeater will primarily serve the ARES for our public service activities and support our Skywarn operations. Feel free to contact us to express your thoughts and concerns on the new system. Thanks for your continued support of Stark County ARES. Terry, N8ATZ - Stark County EC. Welcome to the WD8AYE Repeater System. This repeater is owned and operated by David Beltz, WD8AYE, ARRL Emergency Coordinator for Stark County, Terry Russ, N8ATZ, Assistant EC and John Sedlak, N8WHH. It is presently located at Mercy Medical Center adjacent to Interstate 77 in Canton and was designed and built to serve as the Amateur Radio Emergency Service Repeater for Stark County, Ohio. 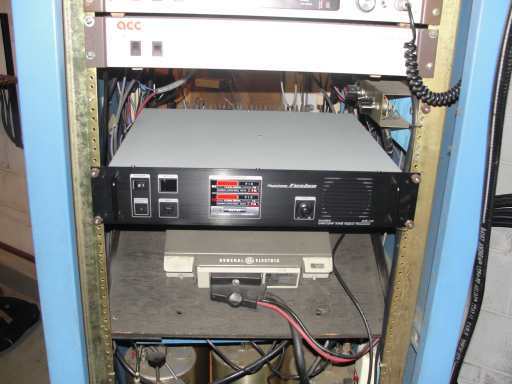 Thanks to a long standing commitment to public service and the Stark County Amateur Radio Emergency Service, the repeater has been located here for over 20 years. As of April 2001 the repeater has over 75,000 hours logged on the transmitter. The repeater is based on the General Electric Master II Hi-Band Mobile style transceiver converted to repeater operation. A base station style receiver is used as the primary receiver which also incorporates a 20 db gain preamp. The transmitter is set at 70 watts into a 6 cavity TX/RX duplexer. Power is provided by an Astron 50 amp supply with battery backup. The antenna is a commercial Station Master located at approximately 1300 feet elevation. The repeater is normally an "open" machine, that is available by carrier access, except during night time hours, propagation band openings or intentional interference, at which time the repeater is placed in "PL" mode requiring tone access. Access during these time is limited, contact a Control Operator for additional information regarding this mode of operation. Repeater control is performed by the Advanced Computer Controls RC - 850 controller, one of the most advanced repeater controllers ever created. An ACC Digital Voice Recorder completes the system and provides real time record able audio for ID's messages, etc. The system also incorporates links on 2 meters, 220, 440, 6 and 10 meters. When not being used for emergency communications, this is an open repeater and is available for all amateurs. It was made possible through the generous contributions of many local civic organizations and the many local amateurs who support the Stark County ARES as well as our friends at Mercy Medical Center. The WD8AYE Repeater System was designed with many features popular on systems existing today. Click on any topic below to learn about the many features of this system. In the mean time click on the link below to see some new pictures from the "Repeater Repair Trip" ! The 147.12 Repeater Technical Committee. The WD8AYE repeater subscribes to the coordination and operating principles as presented by the Ohio Area Repeater Council, Inc. Since 1984 we have been dues paying members and we thank the council for their efforts to minimize repeater interference by coordinating the nearly 800 repeaters in Ohio. In 1984 the F.C.C. issued a rule change basically giving repeater councils the authority to sanction a repeater before it was put on the air to make an attempt to limit the interference to existing users of a frequency. "Coordination" is interpreted to mean a system approved for operation by a select organization of Hams knowledgeable in the various intricacies of repeaters and their operation. In order to follow this guideline, the Ohio Area Repeater Council was restructured and the Constitution was updated to better describe the function it had already been doing. Stark County falls under the direction of Cliff Bade - W8CJB. Click here to go to the OARC Website.